In a large oven safe skillet (we’re using a cast iron skillet) heat 1 tsp. of olive oil over medium heat. Add tasso, onions, bell peppers, garlic, 1 tsp. of Slap Ya Mama Hot Blend Seasoning and 1 tsp. of Slap Ya Mama Cajun Pepper Sauce. Sautee until the onions are browned. Remove skillet from heat and stir in green onions and parsley, mix well and set aside. With a knife, cut a pocket along the side of each pork chop. Try to make the opening as small as possible while creating the pocket as large as possible on the inside of the pork chop. Using a spoon, stuff each pork chop with the tasso filling until full. You can either use toothpicks or string to help hold the pocket closed. Season the outside of the pork chops with the Slap Ya Mama Original Blend Seasoning and the remaining Slap Ya Mama Cajun Pepper Sauce; being sure to rub the seasoning into the pork chops. Using the same skillet, being sure to leave the remnants from the tasso filling in the skillet, heat 1 tsp. of olive oil over medium high heat and brown each pork chop for about 3 minutes on each side or until browned. 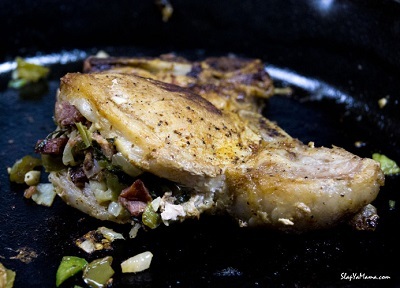 Place skillet and pork chops in the oven and bake at 350 degrees F for 30 minutes or until the internal temperature of the pork chops reach 155 degrees F using a meat thermometer.